Wow, it's hard to believe that Bark Madness 2016 powered by The Royal Half™ is already over! From the Sweet 16 to the Elite 8 to the Final 4 to the Championship Game, the exciting action of Bark Madness has kept hockey fans everywhere on the edge of their seats! And now, it's time to reveal the winner of Bark Madness 2016! 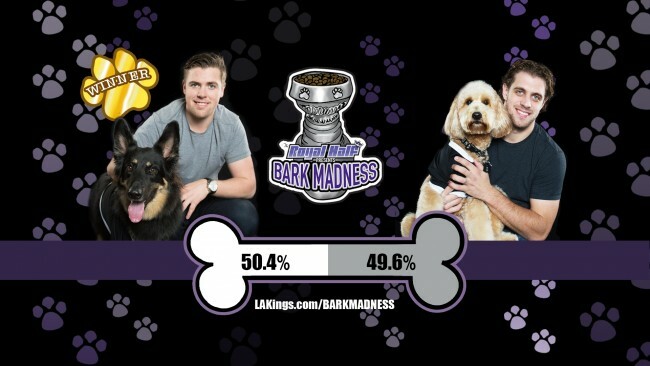 We've had nearly 35,000 votes cast since Bark Madness began a few weeks ago and it's finally time to award the Stanley Pup trophy to the deserving dog! It was the reigning champion, Goldendoodle Gustl Kopitar, against the upstart young rescue pup, German Shepherd/Border Collie Mix Emma Pearson. To say this Final was a dog fight to the bitter end is an understatement. In the end, Gustl had the fanfare, the support of Hollywood liberals, and the official bobblehead. But there is one thing Gustl lacked that every successful political candidate must have ... a hard-luck backstory. Gustl thought that enacting his Goldendoodle Privilege would be enough to coast to victory, but in the process he forgot that people love an underdog. Literally. An underdog dog. Wow, it was really close. PRESENTING THE 2016 BARK MADNESS POWERED BY THE ROYAL HALF CHAMPION, EMMA PEARSON!!! Let's go live to Gustl Kopitar's Campaign Headquarters for his concession speech on this night of Emma Pearson's unbelievable victory. 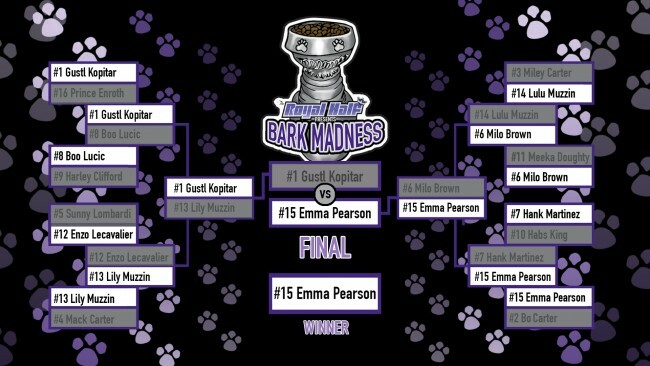 Emma Pearson is the first #15 Seed in Bark Madness history to take home the Stanley Pup. Congrats to Emma, Tanner, Meaghan and the entire Pearson family on their huge win. Remember folks, at the end of the day it isn't about who is the most popular dog. It's about helping dogs in need across the country by supporting local shelters and rescue organizations. The Royal Half will be making a donation in support of Bark Madness 2016 to Wags and Walks and we think it'd be a great thing for you to do too. Thanks to Pat Donahue, Danny Zollars and Alex Kinkopf at the LA Kings and Patrick O'Neal, Jack A. Wilson, Joel Goodling and Steven Dorfman at Fox Sports West for all of their support during Bark Madness. And special thanks to @LAQueenofMeme for all of her amazing Bark Madness graphics!